The Spiro State Bank debit card is a convenient way to buy the products and services you need. Easy access to cash at ATM locations most everywhere you go. Purchases immediately deducted from your checking account. Use anywhere Visa is accepted – online, in person or through telephone purchases. Support your school both in spirit and financially! We are proud to offer these cards through our partnership with Spiro Public Schools and Talihina Public Schools. Participating schools receive extra cash by you using your card! 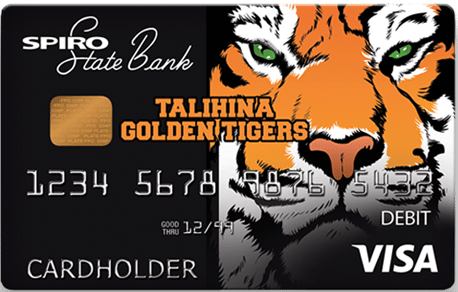 You just need a Spiro State Bank checking account and a Visa Debit/ATM card with your school’s mascot. It’s an easy way to support your school just by going about your everyday business. Amazing what showing your school spirit can do! 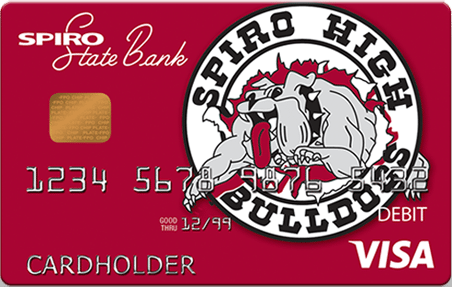 If you don’t already have a Spiro State Bank school mascot Visa Debit/ATM card, contact Spiro State Bank at 1-918-962-2453 and we’ll get you equipped with some new spirit gear! To help avoid an interruption in your service, please inform us when traveling, especially overseas.